Federal Premium 30-30 ammunition has producing arms and ammunitions sine the 1860s. It is a name trusted by shooters, police and military worldwide. Today, Federal Premium Ammunition, produces millions of rounds of quality ammunition every year, for military, police, shooters and America’s hunting community. 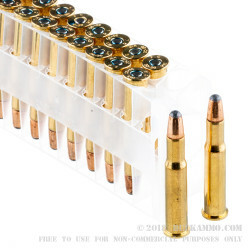 When you load Federal Premium Ammunition into your firearm, you can rest assured you are loading the best ammunition! 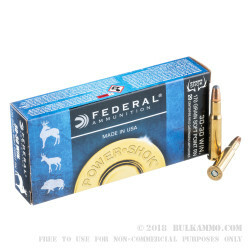 This Federal Premium Ammunition 170 grain .30-30 is the perfect cartidge for your lever action .30-30 rifle. Perfect for dense brush and ranges up to 200 yards. .30-30 Ammunition has accounted for more deer, elk and even moose than most other cartridges combined. 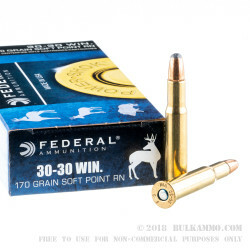 With your rifle loaded with Federal Premium Ammunition 170 grain .30-30 rounds, you can bet when it comes time to fill your freezer it won’t let you down! A: The abbreviation "gr" actually stands for grains. There are 7000 grains per pound, and this use in reference to ammo normally means that the bullet weighs that many grains. 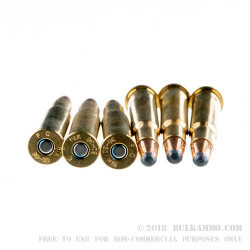 In .30-30, both of these rounds are suitable for deer hunting, and will do their part if you do yours. The 150gr load is a little flatter shooting, but the 170gr load retains more energy at range. Q: Will you be selling .30-.30 and .243 rounds in more quantities, than just the 20 rd. boxes you currently are showing on your website? A: We do sell ammunition in 200rd case quantities, but have not had enough demand for that in .243 or .30-30 to start selling in that amount.